If you’re looking for the finest quality topsoil Hampshire has ever seen, then you’ve hit the jackpot with Abbey Turf. We are the leading supplier of landscaping and turf services in the South of England. Get in touch with us on 0238 0812 302 or 0788 7942 242 to place your order now or to discuss our services and deliveries in some more detail with a customer services representative. When you choose Abbey Turf for all of your Hampshire topsoil needs, you are choosing the highest quality products available on the market. Our company supplies a wide variety of customers – domestic, trade as well as commercial. We are also popular among local golf clubs, authorities and government properties. The Hampshire topsoil that Abbey Turf offers will be suitable for practically any application including seeding, garden borders and turf laying. We employ a comprehensive screening process that enables us to guarantee that our topsoil will be completely free from any weeds or sharps. Abbey Turf topsoil Hampshire will be delivered in maxi bags. Our packaging ensures that the delivery process will be clean, easy and as hassle free as possible. As a general guide, one maxi bag will contain enough topsoil to cover 30 square yards that are one inch deep. All of our maxi pads can easily be lifted over fences to make transportation simple. Why choose Abbey Turf topsoil in Hampshire? Abbey Turf has been around for more than 25 years. We are still a family operated Hampshire topsoil business focusing on continually improving our products and services. We first started with 10 acres of turf and have since expanded to a turf site of 180 acres in size that is dedicated to growing the highest quality seeded turf. If you’re not exactly sure what kind of topsoil in Hampshire is the most suitable option for your property, we would encourage you to get in touch with the expert team at Abbey Turf as soon as possible. Our friendly professionals would be happy to take you through the various different products we can offer you and the specific benefits of choosing each one so you can make an informed decision. 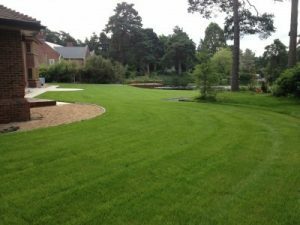 Topsoil Hampshire specialists Abbey Turf have the utmost confident in their products. We are guaranteed to only offer the highest quality lawn turn available. We would encourage you to visit our easily navigable website for some more information on what we can offer you as the number one topsoil Hampshire specialists. You can browse through our virtual gallery for some high quality images of our turf bags as well as completed landscaping services we have carried out in the past. There are several ways to contact the friendly team at Abbey Turf. We are open from 8 AM to 6 PM, Monday through Saturday – you’re welcome to call us between those hours on 0238 0812 302 or 0788 7942 242. If you’d like to place your topsoil Hampshire order or arrange a service via e-mail, please send your request to info@abbeyturf.co.uk. Alternatively, we have a simple contact form on our website – fill it out with some details and we’ll get back to you shortly.